Is it me or are the Kunai a bit too good? Anybody find the controls terrible? Anything I can do? I tried kbm during the tutorial and tried gamepad during my first mission, but neither seem to work well. Pure solo the game gets stale pretty fast, unless you are after the loot/ressource hunt. With friends it gets a bit better. All in all, damn nice and nice looking game for it being free. Just noticed this and am giving it a shot today. I hope you like it. I've been kinda addicted to Warframe since the beta when open back in April. Way too many hours put into it, and yet I still enjoy it; though it does help that the seem to add a little something every (other) week into the game and a big something into the game about every two months. I got my Loki to 11 last night and ended up picking up one of the founders packs and got some more weapons to play with. One of my co-workers is going to give it a try tonight as well. If you're trying to optimize on the things you can only buy with real money (platinum), those things are warframe slots, weapon slots, color palettes, and vanity items (scarves, sentinel wings, etc). Everything else you can potentially get in the game, but there are a few items that you can get only though alerts that randomly pop up (aka, free to get the blueprint for a limited time to craft the item once, assuming you're successful with doing the alert mission). I'll leave it at that before I go and dump too much info on how everything in the game works and make anyone eyes glaze over. Never could figure out why this game didn't take off at all with this community. Fun combat and controls, many carrots to chase, quick missions, and friendly pubbies. I only quit playing because the constant mouse movement was bringing on symptoms of CTS. Given that we have plenty of folks with no hair on their balls around here, that shouldn't be an obstacle for many. I didn't stay for more than a mission beyond the tutorial because of how little they explain to you. What's the purpose of these missions? What's my purpose? What makes my Warframe a good fighter? What makes Warframes different? What's the progression system? How the hell am I suppose to complete this level when you don't give me a direction and make everything look the same? There's more, but that's my problem with the game. Other FtP games suffer similarly. If I can't understand your game, I can't care to bother. Found the game extremely boring. How the hell am I suppose to complete this level when you don't give me a direction and make everything look the same? That was my problem. Combat was basic (it needed some basic FPS elements, cover? leaning? Something other than stand and shoot). But the capper was when the entire team couldn't figure out how to continue on through the mission. It seemed like we needed to go someplace and do something, but even with 4 of us running around corridors and rooms that looked the same, for 30 minutes after killing everything, well, that killed my interest. Yup, the exact same thing happened on my first, and last, mission. The three of us were just running back and forth through the (big) level many times over like chickens with our heads cut off. Since you seem to be trying to peek around a right corner a bit awkwardly, you do know there is a mappable button to switch the right shoulder camera to a left? I have it on one of my mouse buttons exactly for that, but switch always back to the right camera, being so used to it. I am used to using it in Ghost Recon Online, but forgot to map it in this. I just started playing this game. Pretty neat, so far. The maps get a little repetitive, but I like the customization options. For the people that are finding this game boring, I guess that would be you were going in expecting one time of game and getting another. Warframe is sort of a PacMan/Bejewel sort of thing of third person shooters. The things that I enjoy Warframe with is that the levels are almost kinda Left for Dead, where you go though the levels and the director populates the rooms in front and behind you with more enemies (with the lotus telling you that here is more coming instead of it being the music like L4D). And the other big thing is, as you go though the levels, you collect power up core/cards, that you can only equip outside of the levels. So when you do a level in Warframe, you can do the objective, farm for materials, collect upgrades, and that's it. There is no reason to stop, configure upgrades, decide what you want to keep and drop and continue, which is the main reason why I can't stand Borderlands (2) for any long period of time. You run, you shoot, you collect, you complete the level. It's meant to be fast and/or it's meant to be a collection loot feast and not much else. Outside of doing the levels, you put on your upgrade cards to upgrade your Warframes and weapons as you desire. And there are ways to Min/Max each weapon for whatever enemy faction you're going again, but I don't bother with such things. I configure the gun and melee weapons the way I enjoy using them. To get better weapons, you build them from materials from blueprints that you get from the store, or from your clan base, or some you can buy outright with the platinum money currency. In conclusion, if you come to play Warframe for more than shooting AI with friends, on random maps from preset rooms, and collecting stuff for different ways to shoot/slash more AI over and over again, this is not the game for you. Anyone tried this on the PS4 yet? I fired it up for a bit. Looks on par with the PC version on high settings and seems to be running pretty well when PSN is behaving. Works great with the controller, although lining up sword strikes can be a bit rough. I've played some on the PS4 and it feels pretty good I'd say, nothing that's going to change anyone's minds if they didn't like the game before but I'm enjoying it well enough. And if anyone wants to get some multiplayer going feel free to add me on PSN I'm IHateDRM75, though I work nights so it's hard for me to do multiplayer stuff during the week. We played earlier and you seemed to know I bit about the transactions/gear. Where were you getting that info from? Wild guessing. I've since looked up more info and it sounds like the best thing to spend platinum (The premium currency) on is more slots for warframes and items as that and cosmetic stuff the only thing you can't earn in game. Maybe ignore the comment threads underneath for the beginning, quite a lot of inane rambling in there. Slots for weapons, warframes and sentinels are quite valuable. Unless you are content with deleting a frame after playing with it for a while to craft a new one. Many of the weapons and warframes proper can be built (eventually) accumulating resources in game. If I recall correctly bank space can only be purchased. Having the space for more weapons and warframes plays into your overall game rank which is essentially based on the rating/rank of all the individual items you have. Wouldn't mind playing this game with a goodjer that can show me around a bit. Yeah, the game is really obtuse and does not explain itself well at all. You can add me (BNice) but I'll explain some stuff here. The actual in-game stuff is pretty simple. You run around, shoot/slice dudes, get loot and complete different types of missions. Where it gets complex is the outside of the mission stuff. Warframe's and weapons can individually level up to level 30. When a Warframe/weapon levels up it doesn't actually get stronger (The Warframe gains slight improvements but nothing big). Instead, a leveled up Warframe/weapon allows you to install more mods. Mods are what you loot, which are basically stats. It's an interesting twist on loot based games. So for example, a level 30 skana and a level 1 skana do the same exact damage. The only difference is the level 30 skana has more room for mods. So you could equip a mod that takes 10 power slots that does +200% melee damage, a mod that takes 5 power slots that does +50% fire damage and a mod that takes 15 power slots and does +100% attack speed. Now your skana is pretty ballin. The fun is in the player being able to customize their weapons/Warframes with all the different mods. The upper right, where it has "10" denotes how much power it will take up. The notches on the left side of the mod shows you the level of the mod. Yup, you can level up mods as well. So this unleveled Split Chamber mod does +15% multishot. If you fuse it with another mod (which destroys the other mod) it can level up. The stronger mods take a lot of fusions to level up. 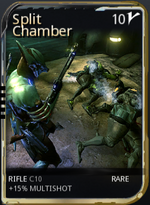 The max rank Split Chamber mod does +90% multishot. So if you have it equipped, every time you shoot your rifle it has a 90% chance to shoot an extra bullet at no extra ammo cost. Pretty snazzy. The bottom right shows the rarity. And the symbol on the upper right is the polarity. Warframes/weapons will have those symbols where you can install mods. If you install a corresponding symbol it will only take half the power. To get new weapons, you go to the market, purchase the blueprint and then build it using resources. You get resources from running missions. There will be a screen on the planet which show what resources have a chance to drop during missions. To get new Warframes, you need to purchase the blueprint but also obtain the helmet, chasis and systems. These usually drop from a specific boss and so you just run it over and over again. The planets aren't really a progression system. Each planet will house all the different types of missions and usually a boss. The starting weapons aren't very good. You can get the Braton for I believe 25,000 credits which is a great all around rifle. The point of the game? Well, right now it's just kind of a Pokemon collect-em-all thing going on. Leveling up Warframes and weapons increases your mastery rank which lets you get access to Warframes/weapons that are gated off. But man, some of the weapons are so much fun. You can tell they still have some of the guys that worked on Unreal Tournament around. The game is also updated frequently. They have an update coming up with an actual good UI instead of the confusing UI that is currently in place. Man, I feel like I've explained a lot but there is so much I've left out. I'd be down to play with you and answer questions on vent or something next week. That was a great summary. I've just played a few missions on the PS4 and I had no idea about any of that stuff.